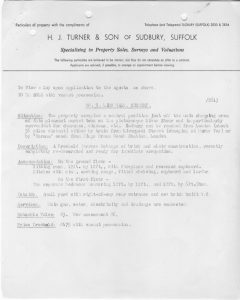 Sudbury Ephemera Archive has been given the details of houses advertised for sale in the Sudbury area by Thornton’s Estate Agency, which closed in December 2016. The papers date back to the late1940’s when the Agency was known as Turner’s or H. J. Turner and Son. 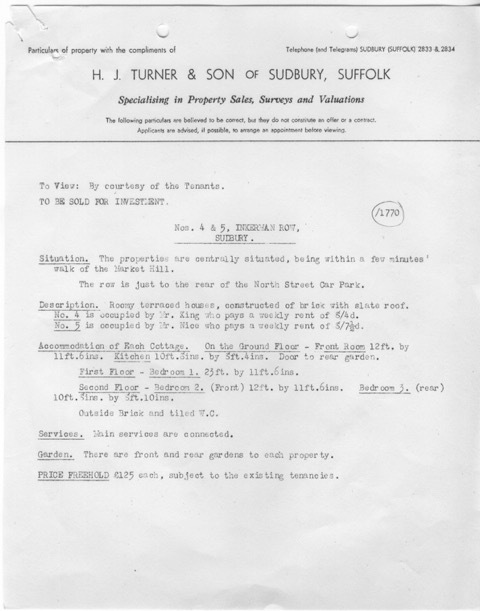 Obviously not all the properties handled by this office were in Sudbury so for the past few working sessions the team have been sorting out details of Suffolk properties to be deposited with the West Suffolk Archive Office at Bury St Edmunds and those for depositing with the Essex Archive Office. 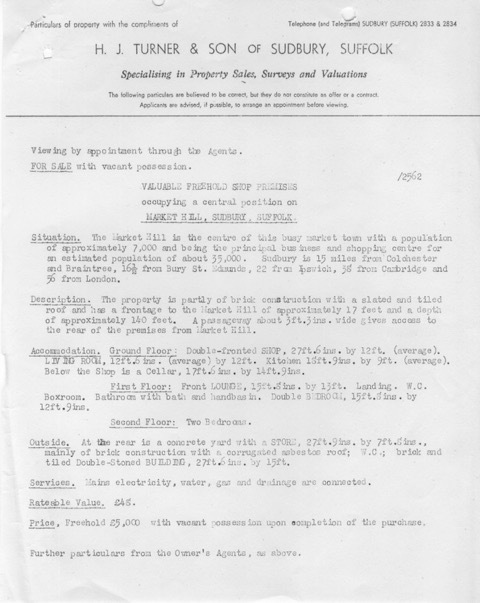 These papers provide details of the rateable value of the property, size and the designated usage of rooms in the house. They can be used as a source for the present day owners or for people trying to discover about the houses ancestors lived in. In some instances the property may have been sold more than once in the 70 years that the business was in existence so it will be possible to identify changes made to the house as well as the value of it. Inkerman Row, the weavers’ cottages which were on the site at the north end of North Street car park were demolished in 1972/3. 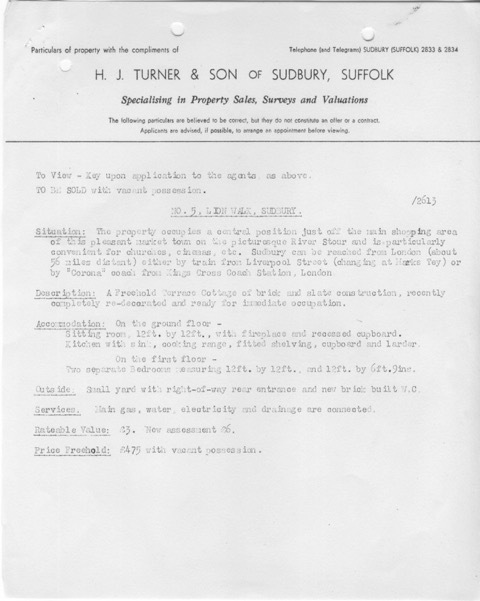 Sudbury Museum Trust’s Caught on Camera website has some photos of Inkerman Row: 1 Inkerman Row, Rear of Inkerman Row, 13 Inkerman Row, 12-17 Inkerman Row, Inkerman Row (front elevation). The decision to demolish these houses was controversial at the time and today Playford Court sheltered accommodation has been built on the site. (By the way did you know the town siren which had been sited on top of the fire station when it was in Croft Road was incorporated into the roof of Playford Court?). 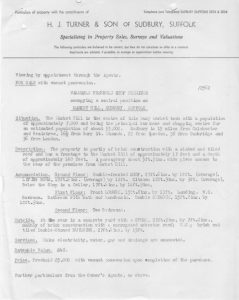 There are two properties for sale in Inkerman Row and the document names the tenants and the price paid by them per week for each cottage. 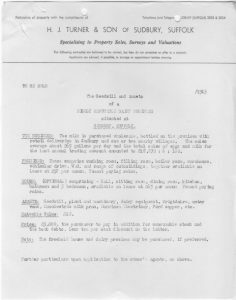 The papers are not limited to the domestic market as some commercial properties are appearing as we sort through the files. For instance, there is a business premises on Market Hill, the details of which remind us that often the shopkeeper lived above the shop and many business were family concerns before the large national multiple stores came to the commercial centre of the town. A Dairy Business for sale in North Street has interesting details explaining that the sale includes the goodwill and assets. The house is apparently optional so not included in the price and the purchaser will have to pay for consumable stock and debts on the books less 10%. 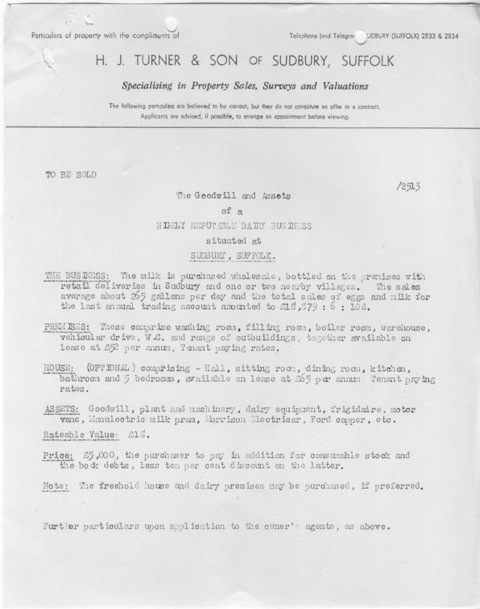 It will take some time before this paperwork is completely catalogued and amalgamated into the archive, but do not be afraid to make enquiries if you have an interest in a Sudbury or Great Cornard property at any time.